This popular theme captures all of the magic of Alice in Wonderland, contributing to an enchanting and magical event. For the ultimate Alice in Wonderland experience your venue will be transformed with Backdrops, Props & Lighting, including a Rabbit Hole for you and your guests to enter into the magical and mystical world of Alice. This popular theme captures the magic of Alice in Wonderland, contributing to an enchanting and magical party. For the ultimate Alice in Wonderland experience your venue will be transformed with Backdrops & Props & Lighting, including a Rabbit Hole for you and your guests to enter into the magical and mystical world of Alice. 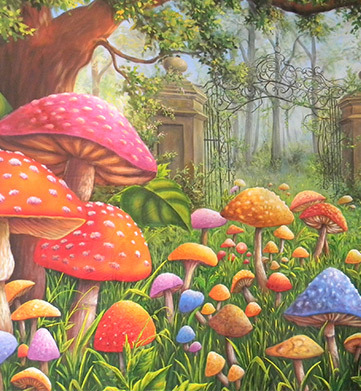 Add some Life size 3D Figures and Enchanted Forest Scenes to complete your Alice in Wonderland theme. Arriving at the event, the entrance is transformed in to a tunnel with Black Star Cloths giving the illusion of a Rabbit Hole. At the end of the tunnel is a sign, This Way, That Way, Wrong Way. A man-sized rabbit, holding a pocket watch sculptured from balloons is waiting for your guests to arrive. 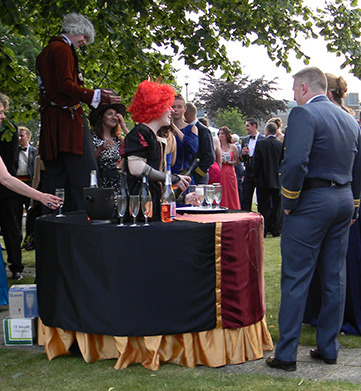 Guests outside enjoy the beautiful summer’s evening. In the guise of the Queen of Hearts stands a ‘Living Table’ serving welcoming drinks to your guests with little labels saying ‘Drink Me’. Suddenly a Mad Hatter on Stilts rushes by announcing dinner is served. As your guests make their way through to the dining room they are amazed once again by the Inside Out Room. Tables dressed for dinner with oversized teacups and place mats displaying a clock turning backwards. Brightly coloured serviettes – yellows, greens and pinks are scrunched together in wine glasses giving an informal relaxed tea-party atmosphere. 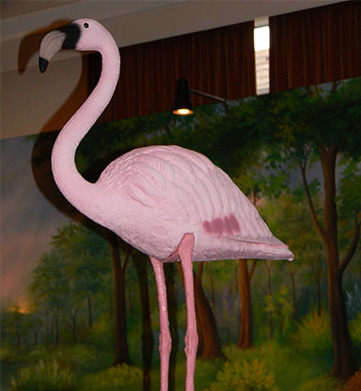 Pink Flamingo Statues stand proudly on the tables with their necks stretched across the room. Eat Me, Drink Me, This Way, That Way… The atmosphere is captured and savoured by all your guests. The sounds of screaming and laughter take guests through the tunnel and back into the late evening, where a funfair with bumper cars, flashing lights and loud music offer another adventure as each turn of the Ferris Wheel takes guests on their journey through The Looking Glass. Some of your guests enter another room through the Tunnel which leads to the Fun Casino Room where Croupiers grinning like Cheshire Cats deal their cards and spin the roulette wheel for all those who dare to take the risk. Back through the Tunnel as other guests discover the Party Room where they dance into the early hours to a Live Band and a Professional DJ, entertaining you and your guests well into the morning. As the last of all the merriment subsides, you and your guests head back through the Tunnel to make your journey home.